Enjoy the delicious flavor of Neocell’s Collagen Sport’s Belgian Chocolate and Beauty Burst’s Chocolate Mint.Find out what I thought of these two products! Good Luck SaraLee’s Deals Steals & Giveaways Readers!!!!! Flaver Artisan Crafted Mints / Candies have a delicate crunch with a burst of “flaver”. Made with natural ingredients to create finely crafted sweetness, this inspired gourmet taste will simply put a smile on your face. * salty and sweet taste. Snappers Peanut Butter Pretzel with Milk Chocolate for that crunchy and salty and sweet taste. Delicious Pure Coffee Cup of Honduras Eastern Mountains! Iced or traditional hot, you will surely enjoy pure flavor from central America. Strong and Succinct wake up flavor to enjoy and start your day. Roasted medium, we recommend 1-2 tablespoons of coffee depending on your mood! Protected with an air valve to allow excess CO2 to leave but keeps all the flavor locked in. You will enjoy a traditional best cup for sure directly from where coffee was produced! Honduras! Solid Package that can be used to store coffee in the future or other type of grains! It is strong and can easily carry 2LB! It can be used as your imagination allows! Arabica only best coffee beans in Briceño Roast, full of Honduras flavor! In a Briceño cup you will enjoy a unique bittersweet mix of Honduras best coffee beans. Alkaline water delivers balanced pH which aids and enhances our busy modern lifestyles. To get and stay fit, we all need an adequate supply of water every day – and that means more than just a bottle here and there. Small expensive bottles of water have been over-consumed for years… and we know the waste generated by their use simply doesn’t justify them as an environmentally proper means to manage our daily water needs. This extraordinarily aromatic and medium-roasted coffee blend produces a fragrant, sweet and mellow cup of coffee. Bannock meals are the ultimate in outdoor meals! These meals a specially formulated to be healthy, satisfying, and full of the essential vitamins and minerals you need for your outdoor adventures. Your family and friends will thank you for making their camping, hunting, backpacking, hiking, or outdoor adventure a treat with each of these delicious meals. Each pouch contains 2.5 generous servings, which means each 6-pack can comfortably feed up to 15 people. Enjoy your outdoor experiences even more by bulking up on delicious Bannock breakfasts and desserts, you won’t be disappointed! Prepare for your upcoming camping, backpacking, hiking, or boating trips now by purchasing in bulk and having enough delicious food for all your friends and family! Bannock meals cook in the pouch and easy to prepare! Welcome to the Balance Bar Chocolate Crunch Energy Bar Giveaway! When you are trying to eat healthier, it can be hard to find snacks that pull double duty – providing nutrition and letting you give in a bit to your sweet tooth. The Balance Bar Dark Chocolate Crunch energy bar can do just that! Krista over at Savory Savings recently had the chance to review this chocolately bar and shared her thoughts in a review – check out what she had to say about the nutrients, rainforest alliance and more! How would you like to win a box of Dark Chocolate Crunch Balance Bar energy bars? If you would like a chance to win, enter with the Giveaway Tool below. If you have won a Balance Bar giveaway anytime from another blog in the last 12 months, you are not eligible to win this giveaway. The giveaway will run from April 19, 2013 through May 3, 2014 at 11 PM CST and is open to US residents, ages 18 and older. Entries will be verified. Winner will be notified via email (consider adding gloriouslygreengal@gmail.com to your safe list) – winner will have 48 hours to respond and claim prize or another winner will be selected. Christina B. is the winner! Our toffees are covered in a rich blend of Guittard milk or dark chocolate. In between the layers of chocolate is the most buttery almond toffee with the perfect crunch, not too hard, not too soft. We top our almond toffees off with a splash of chopped almonds. Let me say that the Dark Chocolate Toffee Nuggets and the Milk Chocolate Almond Toffees were a hit at my house. My family and friends enjoyed them. I liked how the dark chocolate melted in my mouth. I am a sucker for dark chocolate. My mom made cup cakes filled with the Toffee Sauce and they were great. I was on Elaine's Toffee Company and saw a few other items that I would love to try out. There also gift baskets available for when you want to get that special someone a yummy gift. Now for the giveaway: One lucky person will win Elaines Toffee Company products. This is open to US, 18+ and ends 1/06/2014 @ 11:59 pm est. To enter, Simply do the tasks on the Giveaway Tools widget below and you're set to have a chance to win! Remember you can't win if you don't enter. It only takes one entry to win! Julie L. is the winner! Enhance memory, focus and concentration. There are 3 servings (9 gems) per box. A single serving (3 gems) has the caffeine equivalent of a cup of coffee. Each gem has only 15 calories and less than 1 gram of fat. Energems’ unique delivery system allows consumers to conveniently and discretely consume the appropriate amount of energy as needed, when needed. Energems were a great hit with my husband and son. My husband liked that he could pop one or two in his mouth and get that extra boost of energy to help him get through his day at work. My son liked to eat an Energems when he would get the mid day slow down at school. Over all both my husband and son really liked the taste and how it gave them the extra energy they needed. My husband has ask me to get more of them so that is a good sign. Since I can buy these at Dollar General, I have no problem getting my husband and son Energems when they ask for them. Guylian Artisanal Belgian Chocolates provide the ultimate experience for chocolate lovers. Each luxurious chocolate seashell is marbled with 100% pure, silky smooth milk, dark or white Belgian chocolate. Our irresistible seashell chocolates are filled with a rich, decadent, and luxuriously creamy chocolate truffle; the original handmade recipe of Guy & Liliane. I was give a really nice assortment of Guylian Chocolates to try. The truffles were gorgeous to look at and wow were they good to eat. I had to share these with my mom as she is a huge chocolate lover. Each truffle just melted in your mouth and was so creamy. My mom and I had fun trying the truffles. I ended up leaving a few with her to share with my step dad. I also loved the no sugar added dark chocolate bar. I really am a huge dark chocolate fan and this did not disappoint. Guylian is a nice way to add a little flare to your candy dish. I know the chocolates didn't last long in my house that is why I shared with my mom first so she could see how lovely the Guylian chocolates were packed. 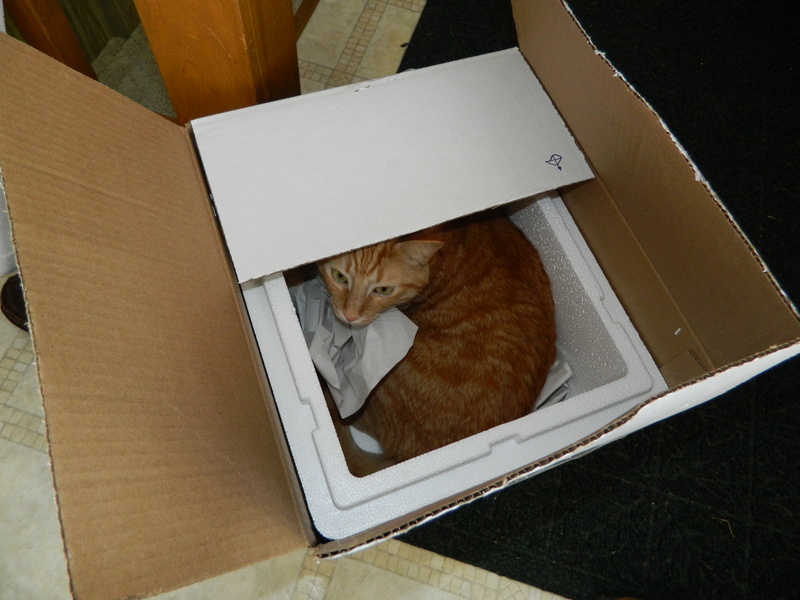 My mom's cat Tazz loved the box that I got the chocolates in. Now for the giveaway: One lucky person will win an assortment of Guylian Chocolates (detailed above). This is open to US and ends 5/30/13 @ 11:59 pm est. To enter, Simply do the tasks on the Rafflecopter widget below and you're set to have a chance to win! Remember you can't win if you don't enter. It only takes one entry to win! Disclaimer: I got the assortment of Guylian chocolates free to do this product review and was not paid for my response. Please note that SaraLee's Deals Steals & Giveaways are not responsible for sponsors who do not fulfill their prize.